Depth prevailed at Saturday's Rhode Island Track and Field Championships as Westerly High and Bishop Hendricken each went home with the team hardware at Brown Stadium. The Lady Bulldogs collected 99 points, a comfortable 47 points ahead of second-place Barrington. La Salle was third with 46. In the boys' competition, the Hawks defeated runner-up North Kingstown, 107-70. East Greenwich was third with 47 points. Westerly's Randi Burr captured the 3,000-meter run with a time of 10:21.1. Burr trailed front-runner McKenzie Doyle during the late stages of the race. She overtook the La Salle junior with a little less than a lap remaining. Doyle, the Class A winner, clocked an eight-second best of 10:25.06. Burr also finished second in the 800m run (2:17.55) and anchored the school's first-place 4x800m squad (9:34.13). 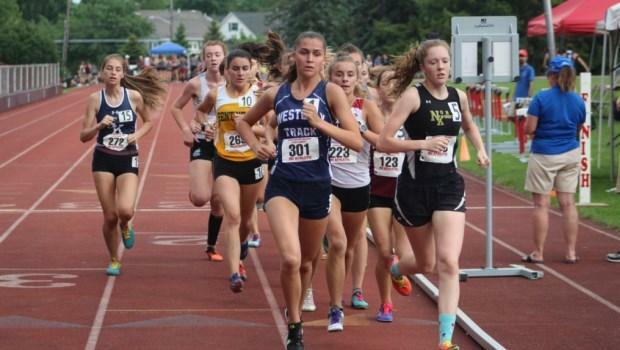 A rare false start in the 1,500m fueled the Westerly standout to her 3K victory. North Kingstown's Tereza Bolibruch earned a record fourth straight title in the 100-meter hurdles. Bolibruch was timed in 14.95. The Skipper senior, a three-time 55HH indoor champion, held off strong efforts by second- and third-place finishers, Eva McCool-Guglielmo of North Kingstown (15.17) and West Warwick's Virsavia Goretoy (15.18). Portsmouth's Nikki Merrill was a double-winner, claiming her second straight 1,500m and 800m titles. In the 1,500m, Merrill built a sizable cushion early in the race and won comfortably with a time of 4:37.73. Barrington's Katie Zitzmann was second in 4:44.70. The Portsmouth junior blazed to an opening 400m split of 63 seconds for the two-lapper and finished with a state-leading 2:13.45. Bay View's Aliya Barrows made it to the top of the podium twice. She captured the 400m dash in 56.81 and the 200m dash in 25.52. Mount Pleasant's Abraham Tambah won the 100m (10.81) and the 400m (49.47). Ponaganset's Gianna Rao won her second consecutive hammer title with a heave of 180-10. Finishing second was Barrington's Annika Kelly with a toss of 169-2. Classical's Jacob Furland took the boys' title with a heave of 212-9. Furland had to sweat this one out with Hendricken's Ryan Morel uncorking a final throw of 212-2 to take second. East Greenwich's Cebastian Gentil came up big for the Avengers. The talented senior broke the meet record for 800m with a winning time of 1:53.21. Classical sophomore Conor Murphy was second in 1:54.30. Gentil also anchored his team's first-place 4x800m (7:56.5) and 4x400m (3:22.38) squads. In one of the closest races of the afternoon, Hendricken's Duwuan Edwards eked out a slim victory in the 300m hurdles where he was timed in 39.81. Central's Jancy Mwelwa finished second (39.84) and Chariho's Mitch Morin was third (39.85). The Hawks also had a win from Kahlin Watkins in the long jump where he leaped a winning distance of 22-4. Hendricken solidified its crown with an impressive 1-2-3 finish in the 3,000m. The race was won by senior Sean Meehan with a PB of 8:34.21. He was followed across the line by Jack McMahon (second, 8:40.34) and sophomore Luke Henseler (third, 8:43.46). East Greenwich's Jeffrey Pederson out-distanced La Salle's Joseph dos Reis in a fast 1,500m race. Pederson took the pace out hard, hitting his opening 800m in 2:04. He then had to hold off a spirited effort by dos Reis the final straightway. He finished with a best of 3:53.53. Dos Reis was timed in 3:54.22, also a best.